A good chocolate cream caramel is not only delicious it is also very addicting. At times I prepare them with pre-toasted hazelnut which is just as with salt, an irresistible combination. Caramels can be a little finicky to prepare, undercooked and they will not cut properly, overcooked and they will be too firm. If cooked too slowly they may turn grainy, cooked too fast in a poorly made pot and the caramel may burn! It is clear to see why some people find them too much trouble. For caramels you need a good pot to cook the mixture in. I prefer to cook caramel on an induction cook top over gas. (But then again I prefer induction for most things I do in the kitchen) If I had a rounded bottom copper pot perhaps then I would use gas. Induction cooks very fast and bothersome gas flames will not flare up along the sides of the pot. 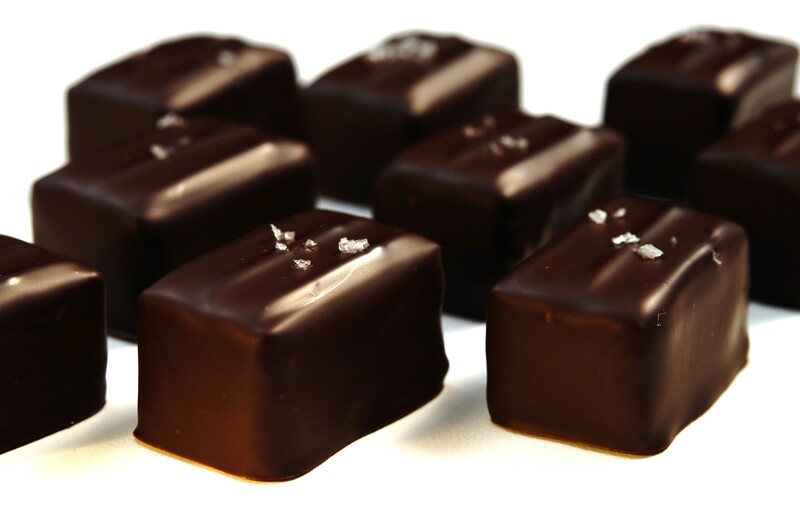 Preferably prepare the caramel a day or at least 5 hours before dipping in crystallized couverture chocolate. Making it a day ahead will make the cutting a lot easier and the caramel will be less sticky. Place candy rulers in a 10 inch (25 cm) square pattern on a Silpat which is placed on a marble. Combine the first 5 listed ingredients in a heavy bottom –well made pan and while constantly stirring boil to 250F 121C. Pour the caramel quickly between the rulers. Do not scrape the bowl! Scraping remnants out the bowl can very quickly make the caramel turn grainy. Let the caramel set preferably overnight. Cut into desired shapes and dip in crystallized (tempered) chocolate couverture and sprinkle with fleur de sel. Fleur de sel Caramel chocolates are my favourite right after a creamy Gianduja filling. I’ve made a few chocolates during my few culinary adventures in my kitchen…and yet have never ventured towards the luscious caramel. 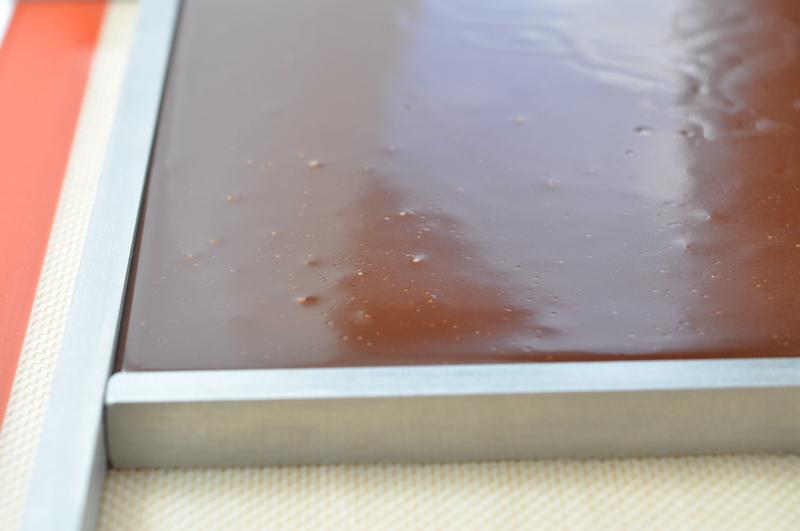 I had been looking for a chocolate caramel recipe that works and this one came out perfect! Instead of dipping the caramels in chocolate I wrapped them in cellophane. Just delicious! Going to have a go at this as soon as I’ve whipped up some invert sugar. Just quickly checking if anyone knows of a handy online shop for confectionery making equipment? I’m living in Sydney and have had no luck with any of the shops in the area – just lacking the candy rulers although I’m sure I can work around that problem somehow. Mmmm! Yeat another sweet confection! Each year at Christmas I bake and, since I took Chocolates last Spring, I’ve been thinking heavily on putting together an assortment of chocolates for people – especially at work because, now that I work in a bakery, I feel I need something to give that is unusual as opposed to commonplace and everyday. Thanks for this recipe, Chef Eddy! This will make a nice addition to what I have in mind! I love making these! They are a wonderful! Thank you For posting and sharing this recipe , I do have a question regarding the caramel, is there any way to make this caramel with a little bit thinner consistency ,I was looking for a caramel that is good enough to fill a chocolate cake with, and I thought the caramel in this recipe would be too thick, thanks again ..
Sure, you can. What you can do is once you remove it from the heat, add whipping cream to the caramel. I would have to test myself before I could give you an exact amount. The good thing is that you can always remelt in a microwave oven and add a touch more cream if needed. I was wondering which technique you use for creating those thin decorative lines on top of the chocolates? This is how it is done. As soon as the caramel is dipped in tempered chocolate and is placed on parchment or plastic, you take the chocolate dipping fork (here I used a 3 prong one) and “mark” the surface of the caramel. So basically you dip the fork onto the still fluid chocolate, the fork will automatically leave the imprint. Basically this can be done with many types of forks and such. With practice you will be able to make these very beautiful. All the best to you! Just a quick message to thank you for the fast response to my question. Your site has some great stuff and just this week I finished your ‘Belgian chocolates’ (as it turns out I’m from Belgium too). I’m really happy with they way they turned out (and they taste great). (no need to actually post my URL in your comments, I’ve just included it for your viewing). I looked at your pictures. Your chocolates look great! Last night I tried to make your caramel but things didn’t work out (twice). The caramel turned out to be rock hard (glass like breaking properties) and nowhere near your deep dark colour and softness. The first time I usually cook up a small batch to get a feel for it, before I start making a large quantity. I had to improvise somewhat due to missing ingredients, and don’t know if that might have attributed to my failure: extra fine sugar (130g), cream 35% (130g), glucose syrup (15g) instead of inverted sugar (I hope glucose is ok? 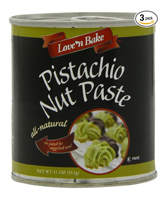 ), vanilla essence instead of vanilla bean paste (I was unfamiliar with the paste). I cooked it using a heavy pot on induction. It quickly reached 121°C, but I didn’t know for sure how long it needed to stay on. I initially wanted to keep it on until I got your dark colour, but after cooking for a while at approximately 121°C it didn’t get any more darker so I took if off. It was still rather only lightly coloured and once it cools its gets completely hard. If you have any ideas as to what went wrong, I’d be delighted if you are willing to share them with me. Sorry that this did not work out for you, I checked the recipe and I believe I am to blame for the problem. In the recipe ingredients I listed only one time chocolate (180 g) which has to be boiled into the mixture. 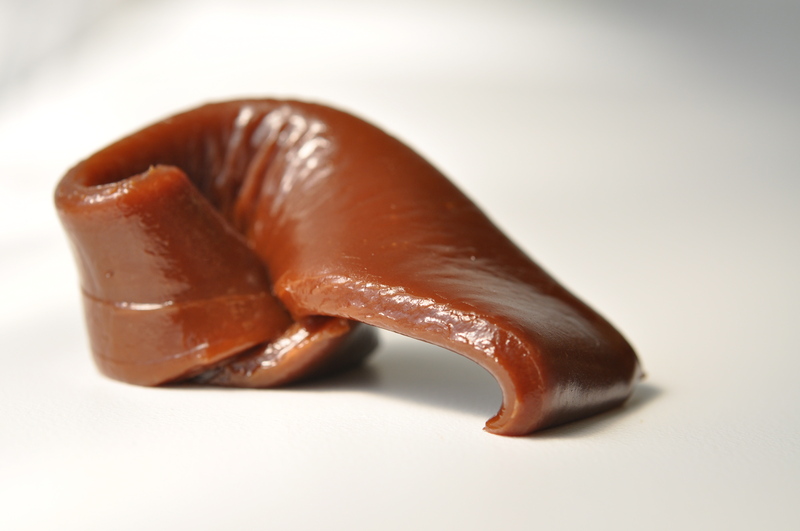 The second chocolate (which was not mentioned in the recipe ingredients, only later on in the procedure) is used for dipping the firmed caramels. I assume you believed that the 6 oz of chocolate was meant for dipping and therefore you cooked the caramel without the 180 g of chocolate. This makes indeed glass like caramel, not the stuff you want to eat. I have updated the article and now things should be more clear. However, if this is not what happened, would you mind getting back with me on this? I want your caramels to be wonderful. I am really sorry again that you wasted your time and ingredients. That’s indeed what happened. I assumed the chocolate was intended for dipping (if I had looked at the quantity I would have realized that it wasn’t for dipping). So, I had another go at it (using dark couverture with 53% cacao mass) and things are looking much better now. The colour now resembles yours and it’s much softer now. I’ll have to wait until it has set completely to know for sure that everything went OK, but I’m optimistic (I did accidentally let the temperature go too high to 130°C this time, hopefully this has no negative effects). Just wondering what the best way is too cook the caramel? Let it slowly reach 121°C or can I do it rather fast (which is easy on induction)? And once I reach 121°C, is it immediately ready to be poured or should I leave it to simmer at that temperature for a short while ? Thanks for helping me out so quickly. Don’t worry about the wasted ingredients, these things happen. This is still a test run in limited quantities, next week I’m expecting my candy rulers to arrive and then I’ll hopefully be able to make them as fancy looking as they do on your pictures. Cooking to 130C will give a firmer caramel (more water from the cream has evaporated) and at times it may start to separate (curdle). Be careful serving these to friends with fillings in their teeth….it may pull them out… Making small amounts is difficult in terms of getting the temperatures just right. Also, like I mention in the article making caramels is not that easy. It does require careful attention. If you like these you can always add flavors such as mint, chopped candied orange peel…..
Do you/have you gone to school for this or is this a hobby for you? If you are into chocolates, Roger Geerts from Belgium has a good book on Belgian chocolates. This morning after a good night’s rest (at least for the caramels) I finished the chocolates. Texture and taste of the caramel is great. Delicious, couldn’t stop tasting. Marking the surface with the 3 prong chocolate dipping fork went great. I noticed that If you wait briefly after dipping, you’ll be able to get a more pronounced decoration. A simple decoration technique, but it looks really nice. Due to the softness of the caramel I found it a bit harder to get them back off the fork, they seemed to attach slightly to the fork. Next time, just like I did with your ‘Belgian chocolates’, I’m probably going to apply a thin layer of chocolate to the bottom of the caramel right before I cut them. I found a hard bottom surface to be most helpful while dipping. I did run into a problem with their shape. I really wanted them to be perfectly rectangular. Upon cutting them I already noticed that they started to deform due to the pressure caused by cutting (perhaps a warm knife will help). But even then, after having all the pieces lined up while I was busy tempering my chocolate, I noticed that gravity also was having a go at them and they started to look slightly squished. Perhaps next time, to avoid this, I should keep them confined within the caramel rulers? I really would like them to be perfect. Yes, I know the book by Roger Geerts. In fact, I even have it. Didn’t have time yet to get really going with it, but it’s definitely on my to-do list. 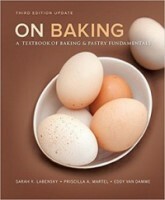 I also got myself the book ‘Perfecte pralines’ (http://www.lannoo.be/content/lannoo/booksinenglish/1/index.jsp?titelcode=7231&fondsid=2). Definitely a source for inspiration. Regarding your question, I haven’t gone to school for this, it’s just a hobby (I’m in fact in IT). But I’m starting to develop a real passion for chocolate. It’s not always easy doing it as a hobby, you don’t always know where the look for the right materials and ingredients (gianduja anyone?) especially in non professional quantities. But I enjoy it a lot and find great satisfaction in making great looking great tasting chocolates/pastry (or at least attempt to). I really learn so much by reading your blogs. I notice that your chocolate caramel recipe does not include butter. In my vanilla caramel I do use butter but not in the chocolate one. It has been my exerience that in this particular formula I prefer the outcome without using butter. These caramels keep giving me trouble. In a previous attempt they tended to loose shape, but I could still cut them into pieces and it was possible to dip them in chocolate. To get perfect caramels, I had another attempt at it and this time I also used silpat and candy rulers. I poured the caramel in, unlike previous time I took the pan immediately off the heat at exactly 121°C (as opposed to letting it cook until 130°C, which I accidentally did the previous time), and let it set for 24 hours. Unfortunately, this time the caramel wasn’t even usable, the caramel was too fluid and removing the caramel rulers just caused the caramel to freely, albeit slowly, flow. Perhaps only cooking to 121°C may account for the extra liquidity, but still 121°C should have given a perfect consistency. So, maybe the other ingredients are at fault? From my first failed experiment I know that the chocolate is the softener for the caramel. If you don’t add chocolate, you get rock hard caramel. 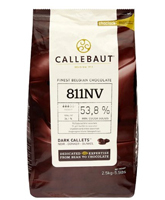 I use Callebaut 811NV dark chocolate couverture (54% cacao mass), which has less cacao mass than the one you used. I don’t want to give up and really want these caramels to succeed. But currently I don’t really have a clue as to why I can’t get the consistency right. I’m thinking about experimenting with the amount of chocolade (e.g. use only half of what is normally used and see if this has a desirable effect, and then fine-tune the amount of chocolate until I get it just right). By the way, I used glucose syrup instead of invert sugar, but I don’t think this this would make such a difference? If you have any thoughts on this, I would really appreciate it. Could it be that your thermometer was touching the bottom of the pan and giving you a higher reading that what the “main” caramel actually was? That would be my very first checkpoint. If you are pretty sure about the fact that you did have the temperature correct than the chocolate has to be the problem. In all honesty, I have not made these with a chocolate containing a lower cocoa mass content. (54%) and therefore I am not 100% sure if that is the problem. A higher cocoa mass content will balance the sweetness of the caramel well. What I would do is remelt the caramel that you have right now-you could start in a microwave oven and than pour into a saucepan and make sure that the “center” of the caramel is at 121C. Using less chocolate would make it too sweet, even using a chocolate with less cocoa mass will make it sweeter. 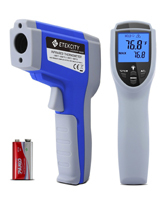 By the way, stick your thermometer in boiling water to ensure that it reads 100C. You will get these perfect. I’m finally getting somewhere. I’m pretty happy with the result even if there’s still room for improvement. I’m not sure if previously the thermometer was touching the pan, but that’s definitely something I need to keep an eye on. Thanks for the tip. Also, instead of using 54% couverture, I switched to 70% dark regular chocolate (no couverture). And things turned out pretty OK this time. Still having slight problems of keeping everything into the desired shape. Mostly due to the pressure while cutting everything gets somewhat squished. So I had to ‘unsquish’ them slightly before dipping. Also, before cutting them I put a thin layer of chocolate on the top and bottom side of the caramel to get some extra support, but I guess a thin layer of chocolade only at the bottom side should be sufficient next time (makes it easier while dipping). I’m thinking the room temperature also plays a significant role, 23°C makes the caramel softer and more difficult to handle. Next time I’m gonna cool it to 15°C (the warmest temperature my fridge is able to cool). This hopefully should make the caramel easier to cut without losing the nice rectangular shape. Although, I’m not sure about dipping 15°C fillings into chocolate, I’ll have to try that and see how it goes. Pretty soon I’m gonna give it another try and see if I can improve upon the current attempt. If they are still a bit soft to your liking I would cook the caramel a few degrees higher. This will result in a firmer setting caramel. 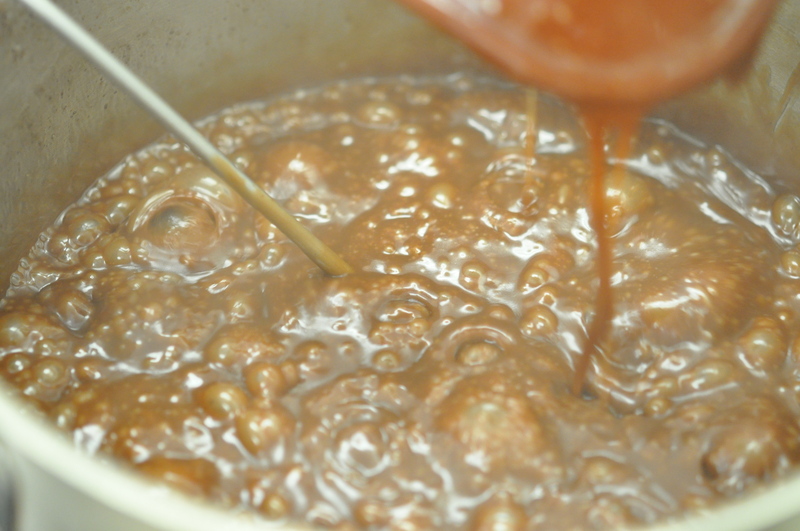 Adding more chocolate is also an option, as chocolate will re-harden inside the caramel and therefore make it firmer. What I do not recommend is cooling the caramel in the refrigerator. 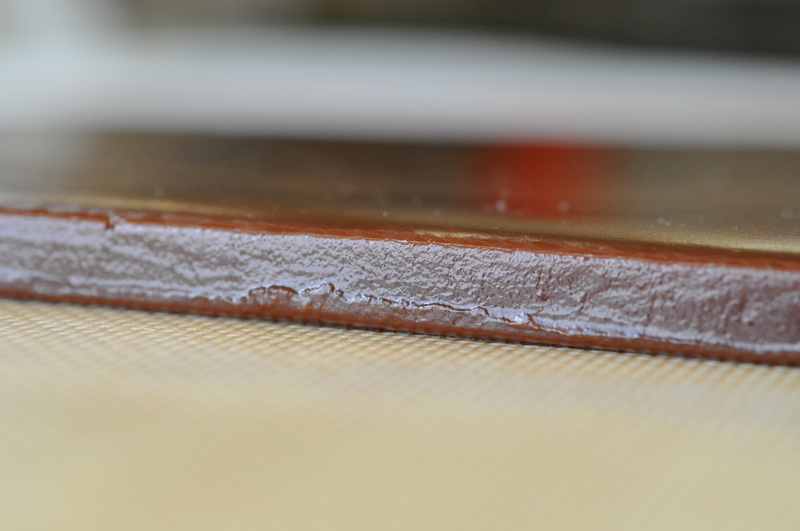 Once the caramel is removed from the refrigerator condensation will set on the surface. This condensation will than be trapped when the caramels are dipped in chocolate. It is in this area (between the actual caramel and the chocolate) where mold will grow. By looking at your pictures it is clear that you are very close to the right texture. I’m glad you are into perfecting these. I am a huge fan of chocolate caramel. 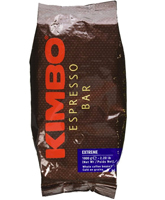 As a child I would eat chocolate caramels wrapped in a brown wrapper adored with an elephant…. I have a feeling it’s going to be a challenge to consistently produce caramel with the exact same texture. I noticed that when it reached 121°C it very quickly rose a few degrees higher and I had to act very quickly to take the pan off the induction. Perhaps I should cook at a slightly lower setting in order to get a more controllable, less speedy temperature rise. Either way, I’ll take both of your suggestions (temperature and chocolate) into account when trying the next time. Do you think condensation is also going to occur with cooling to only 15°C? I was expecting/hoping that the temperature difference would be small enough to avoid any condensation. You can lightly oil the rulers. The caramel can be cut without making the knife hot. I’m not able to make this caramel recipe work I made it again and already the surface looks like the first time i made it – coarse and pitted, without even cutting into it. The first time looked the same, and was full of crystalized lumps. Not sure if waiting for overnight is going to fix anything for my second attempt. I cooked it to the 250F temperature. I didnt scape the bowl, just poured. i used all the ounce measurements. Can you advise? Thank you. Would this caramel work well to top cakes and cupcakes or pies with or would it need to be made thinner? Thank you, I’ve long wanted to know how to make chocolate caramels. Will be making them to give to friends and family. This looks awesome. What is the shelf life of these decadent treats? I was wondering how this recipe would work if I would like to make apple flavored/ginger infused caramel? Or should I switch to your vanilla recipe with butter instead of the chocolate caramel version? I recently discovered your blog and I’m loving it. Regards from México. You could add ginger to chocolate caramels, that would be very delicious. Adding apple and ginger the chocolate caramels may be a bit much. Your idea of a ginger-apple infused caramel (Non chocolate) sounds amzing. By the way, I have visited Mexico numerous times, love the food, the people and of course the country itself. Need to go back soon. I love the way these chocolates present themselves. Is there a time frame to have these done by? Can they be froze for a long period of time and then served? I’ve always wanted to learn how to make caramel!!!! So I was pretty excited when we were doing these chocolates in your class. My family was too. The Chocolate Caramel were the harder to make because we never the right size.